Aqua Park, Aqua land, water park – dear child has many names. Being near water is welcoming for most people – young as old. 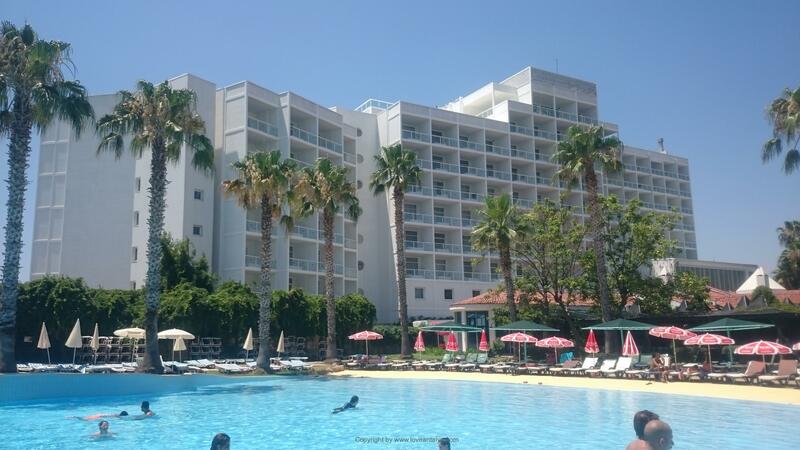 Especially on a hot, humid summer day, where the air stands still and the temperature easily sneaks up around 40 °, which it very often does in Antalya. On such a day we went to Aqualand (or aqua park which I – until now, called it) just right next to the lovely Konyaalti beach. Strangely enough, we had never been there before, so we looked forward to it with great excitement. One can not avoid driving past the Aqua-land when driving around on this side of Antalya. It is located right between Dolphin Land and the fashionable Su Hotel (which I wrote about earlier). So it was not without a good deal of expectation, that we visited the water park. Knowing what the Turks sometimes over do it, in order to please all the many tourists, especially Russians, we were also a bit skeptical, because sometimes it can become exaggerated and too big and wild. And in a way, that it takes away all the fun. This was also partly there (but it could be – and was expected it would be – much worse). It was actually really fun and great to be in the Aqualand. It was not too big and not too crowded (the tourist numbers has tumbled down this year – about 40% lacking compared to recent years), so we had plenty of space and it was a really good experience. 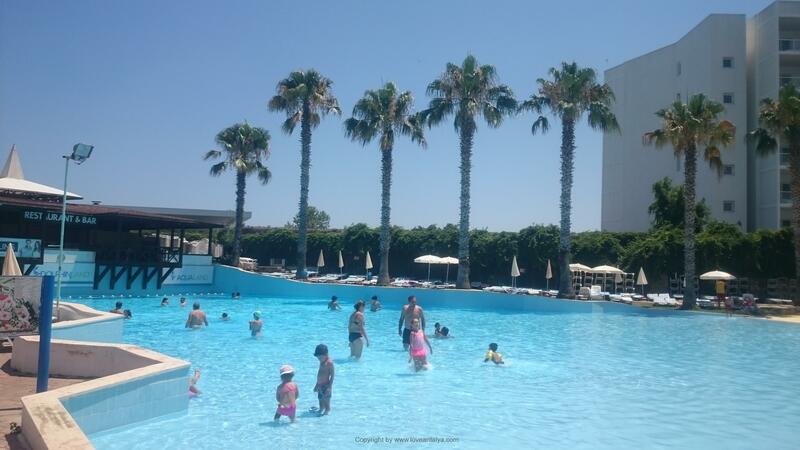 We were especially excited about the wave pool, where the water was wonderfully cool and was so beautiful with the impressive palm trees right by the pool and the impressiv Hillside Su hotel. There was a little Miami vibe about it – lacking flamingos though. But also the big pool with the islands in the middle and the big waterfall in front of the cave was clearly a hit. The water was really cold to say the least, but in some strange way, it’s just nice, when the air is +38. It was certainly wonderful and refreshing and we spent a long time there. My kids couldn’t use the children’s pool, they were told to leave several times, until we asked why. One must max. be 8 years old, so it was a bit of a shame. For even though my kids are 9 and 11, it was still fun for them. There was so much else they could do. We are not the big slide sharks, but there was enough slides to choose from (12 to be precise). And they were actually quite fun with crazy turns, good height which gave butterflies in the stomach. There were lifeguards ready at all slides and pools, so you did not feel uncomfortable or unsafe at any time. However, there were 2 big minus – one was the very expensive food (but this will only be a problem, if you are aware of what it costs on the other side of the doors). And the quality was simply too poor compared to Turkish standard). If you eat there, you should expect to get a real fast food menu with french fries, kebabs etc. to 40-50% higher of what it costs outside. You can survive it, but we just did not feel like it. On the other hand the smoothie bar was fantastic and it was really delicious with a cool refreshment. We bought some of the most expensive ones, costing 15 TR, so I think, this was an okay price. I saw afterwards on some signs, that there were other smoothies and juices, that was written in Turkish. They cost about 10 TR, so it could be considered another time. The second major minus was the music. If you’ve read some of my articles, you may have read about the music on the infamous daytrip boats from the harbor. The music in Aqualand is the same. Extremely loud and without pause. A mixture of Turkish and a bit internationally though, but it was simply too much. Noise all the time unless you lay down in the far corner at the children’s pool or at some of the slides. Compounding with the strong sun, splashing from the pools, hooting from the joyful children and then the very loud music was simply too much. We were all SO tired in our heads. We went home after just under four hours, but it was okay. We needed peace. So can we recommend this place – yes of course (you just need to be prepared for noise and expensivel food). There is neat and clean and we felt safe and welcome. We gave 160 TR to enter so it wasn’t so bad. 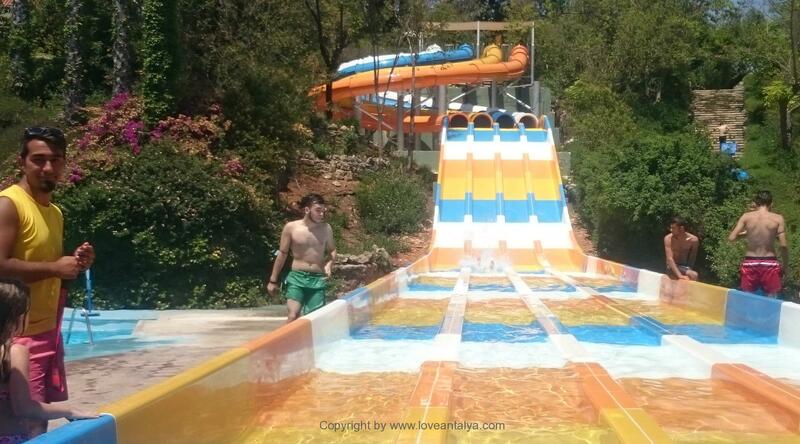 It should be mentioned, that there are 4 large water parks in Antalya and we’ve only tried this one recently. The others are probably also super good. 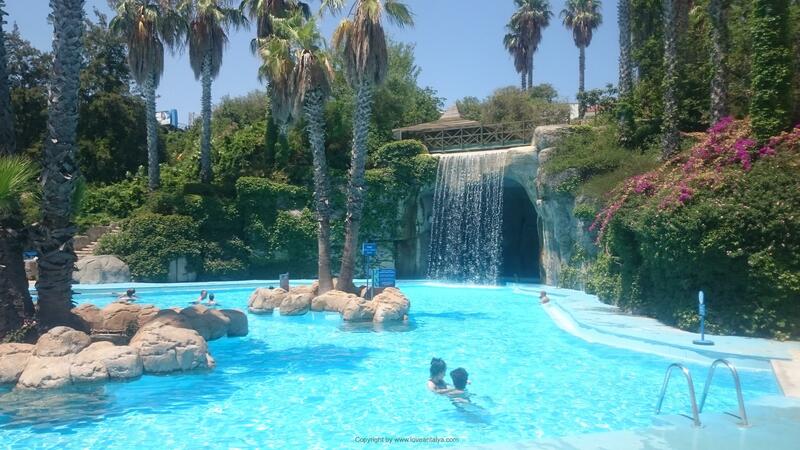 This AquaLand is very central and closest to our appartment. 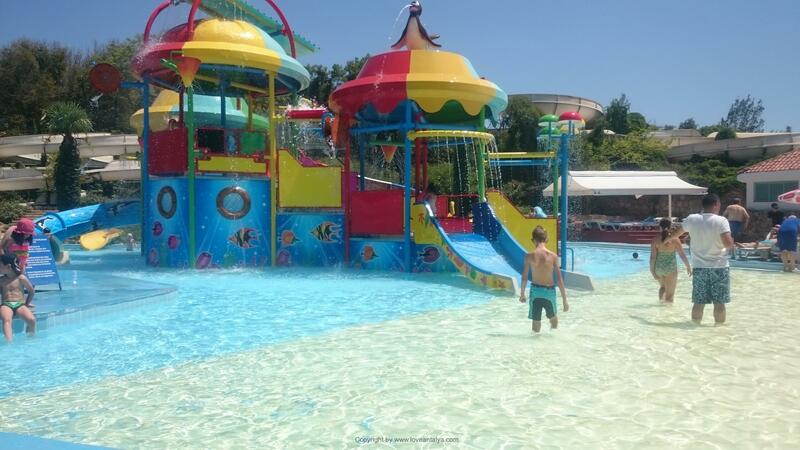 So if you come to Antalya and have children (or just want to relax, have fun and be refreshed) – go to AquaLand, it’s fun. You can see more about opening times, prices etc on their website here.